"Rhetoric of the Classroom" uses principles discussed in Rhetorical Arts and applies them to the everyday roles and responsibilities of a student at LMU. 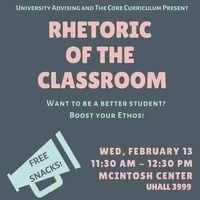 This workshop will demonstrate how to consider your rhetorical choices when communicating with professors, engaging in class activities and discussions, and corresponding via email. Also, there will be snacks!